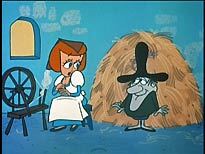 Many American baby boomers regard Rocky and Bullwinkle in the same way that their British counterparts regard shows like The Clangers, Mr Benn and Ivor the Engine. These series provided cherished childhood memories, and they stand up as very enjoyable productions even when maturity has long since been reached. Originally conceived in 1950, under the name The Frostbite Falls Review, The Adventures of Rocky and Bullwinkle and Friends was put on the back-burner for almost a decade when advertisers didn’t take to the idea. 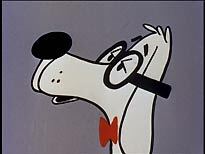 Creator Jay Ward retooled the show as Rocky and His Friends which premiered in November 1959, becoming an instant hit for broadcasters ABC. 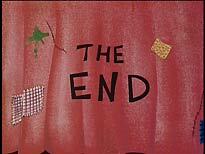 After a successful run the show transferred networks to NBC in 1961, where it was renamed The Bullwinkle Show. (What Rocky thought of this upstaging we will never know!) Both of these shows were later sold in a single syndication package, finally renamed The Adventures of Rocky and Bullwinkle and Friends. Unfortunately for some animation purists the syndicated versions are the ones included on this set, meaning that there will be the traditional timing edits and replacement credits to worry about. To be honest this didn’t really bother me and the episodes still work well. This release comprises the twenty-half hour shows that make up the first series. That includes the Rocky and Bullwinkle stories Jet Fuel Formula and Box Top Robbery (serialised into forty and twelve segments respectively). 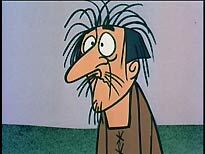 The Rocky and Bullwinkle and Friends format has each half hour segment broken into four sections. In the first season this means that there are two instalments of a Rocky and Bullwinkle serial book ending the two peripheral cartoons, Fractured Fairy Tales and Peabody’s Improbable History. Jet Fuel Formula sees Bullwinkle inadvertently create the worlds most efficient Rocket Fuel while attempting to bake one of his grandmother’s recipes. Unfortunately, in the ensuing explosion, the recipe is torn in half. Now, contracted by the government to produce more of the amazing fuel, Rocky and Bullwinkle must attempt to remember the recipe, while at the same time keeping Spies Boris and Natasha, not to mention some hostile Moon Men, from getting their hands on it. 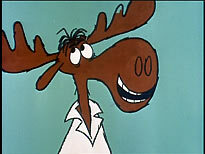 In Box Top Robbery Bullwinkle is the proud owner of the world’s largest collection of box tops, and, since box tops are now the world’s standard currency, he is a very rich moose indeed. Unfortunately somebody is flooding the market with thousands upon thousands of counterfeit box tops. Can our two heroes stop the villain before the world market collapses? Of the two storylines I find Box Top Robbery much more satisfying. As usual with the first season of any television programme, The Adventures of Rocky and Bullwinkle and Friends takes time to find its feet. 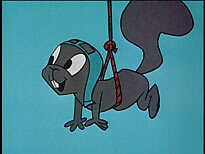 Ward was a pioneer of the limited animation technique, which allowed for television animation to be turned out cost-effectively at a quick rate. This technique is obviously in it’s infancy at the beginning of the series, but, by the second story, there is a great improvement in movement and character design. Something which I found quite jarring was the contrast between the show bumpers added during syndication and the original animated segments. As these bumpers were animated and added a few years after the original episodes there is a very obvious difference in animation style and colour palate. 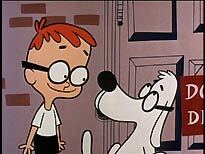 Peabody’s Improbable History is perhaps the most bizarre animated concept I have ever come across: genius hound Mr. Peabody and his adopted boy Sherman travel through time in the “Way Back” machine revealing the untold stories of events past. For example did you know that the reason Napoleon always had his hand in his jacket was to hold up his trousers? You’ll soon find out why! Fractured Fairy Tales are post modern takes on well-known children’s stories, and to my mind they’re not as strong as the Bullwinkle and Peabody shorts. They do, on occasion, however display some very dry wit. Aesop and Son replaced Fractured Fairy Tales during the run in the series, but, after public outcry, the short was quickly dropped and Fractured Fairy Tales was reintroduced. 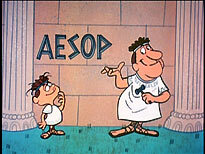 To my mind Aesop and Son are the weakest of the bunch: the fact that they included shoehorned morals goes some way to making this a more kiddie-orientated toon. The twenty-six episodes are spread out over four disks. Each episode can be selected from a static menu. While this may appear a little plain it does get the job done and, more importantly, will be easy enough for young children to navigate. A random sampling of various episodes suggests that the picture quality is, on the whole, acceptable. These are, however, standards conversions from an NTSC source, and probably old conversions: the series suffers from interpolation throughout (interpolation is the blending of two or more ‘clean’ frames to create one mixed frame). Under normal viewing conditions the effect is virtually invisible, but can experienced subliminally. 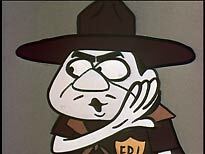 With animation like Rocky and Bullwinkle, where there’s often no substantial change between one frame and another, the effect is minimized. Shot changes, though, are softened. (See the first image in the strip above for an example of an interpolated frame). For a forty-five year-old series the film elements seem to be in reasonably good condition, with only a few minor instances of film dirt and the occasional tramline scratches. What is distracting is a small “R+B” logo in the bottom right corner of the screen. Luckily this semi transparent logo only appears for about ten seconds at the beginning of each cartoon segment and I found that after a while I got used to it. The picture is encoded at a reasonably high 7.35 Mb/sec, with no evidence of MPEG artefacts. Sound is presented at 192kbps in 2.0 Dolby Digital mono. 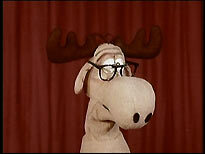 These odd live action segments have a puppet version of Bullwinkle (above) answering questions sent in by viewers with the help of silent movie clips to illustrate certain points. While they can be very funny at times these sections are not put into context in any way at all. The final segment, filmed in black and white, is notable due to the fact that at the end the Bullwinkle head is obviously pulled out of shot by a puppeteer before the camera stops rolling! Here are a selection of promos from the two non syndicated versions of this show, Rocky and His Friends and The Bullwinkle Show. What makes these particularly interesting is the original animation that is not to be found anywhere else in the shows. 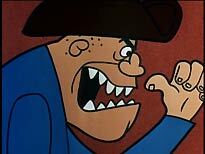 A compilation of clips from the series that illustrate the many disguises villain Boris uses to trick Rocky and Bullwinkle. 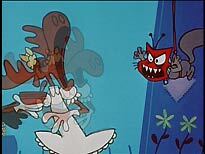 The first segment from a second series episode, The Monstrous Mechanical Metal Munching Moon Mice Mystery, presents more enjoyable fun with Rocky and Bullwinkle. What this extras package is lacking is a commentary on any of the episodes, or a retrospective documentary. The insights of voice artist June Foray, the last survivor of the so-called Golden Age of animation, would have been a welcome inclusion, for example. The Adventures of Rocky and Bullwinkle and Friends might not be to everybody’s taste. For starters it is insanely silly and childish. However this is, at the same time, what makes it so compelling: there's nothing like a really bad pun to raise a smile sometimes. It might be a cliché to say this but this really is a DVD set the whole family can enjoy. What makes this an interesting buy for animation enthusiasts is the chance to see how the show's style evolved in such a relatively short space of time into the format it is remembered in today.